By now, you should be fully aware that Amazon sells its line of Amazon Kindle Fire tablets at a loss. How do they make money, you ask? Good question. By selling you content, apps and cloud based storage, the company comes out in the black. In other words, there is no need to hold a bake sale for Jeff Bezos. 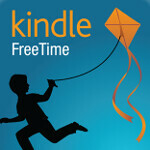 For example, Amazon has just announced "Kindle Free Time unlimited". 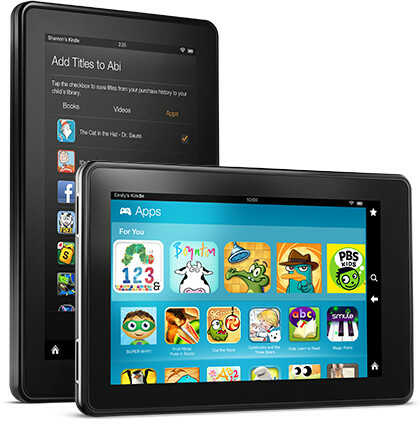 This is an offer for content on all Amazon Kindle Fire tablets for those in the 3 to 8 year old range. It includes all of the apps, music, books, games, movies and television shows that you care to download for the youngsters. It costs $2.99 monthly per child for Amazon Prime members, or $6.99 for the whole brood. If you're not Prime members,than the costs are $4.99 month;y per child or $9.99 for the entire family. Owners of the new Amazon Kindle Fire ,Amazon Kindle Fire HD or Amazon Kindle Fire HD 8.9 will get one free month of the service if they tap the Kindle Free Time app before January 15th 2013. An OTA update will soon be coming that will install the service on your Amazon Kindle Fire tablet. Kids will get individual profiles and won't have to share home screen space with an older sibling or with parents. And if a movie is stopped in the middle because it is time for dinner, the child won't lose his place as the film will start up exactly from where he left off. And even parents will love the service because apps have had all of the commercials and social media removed and there are no solicitations for in-app purchases. Since the service is unlimited, parents can rest easy knowing that their kid won't run up the bill. And all of the content has been pre-screened to make sure that they are age-appropriate. 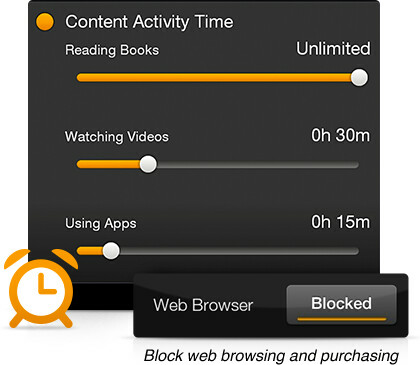 Kindle Free Time Unlimited is part of a new service called Kindle Free Time which allows for parental controls and Time Limit which is a tool used to control the amount of screen time a child gets with an Amazon Kindle Fire tablet. And as far as the content available with Kindle Free Time Unlimited, it covers just about every children's show you can imagine from Barney, Reading Rainbow, SpongeBob SquarePants Curious George to Dora and Disney. If Amazon loses money on the device, but makes money on the services, then why do they limit these services to the Kindle Fire rather than make it available to all Android devices? I installed amazon app store on my phone and I have Kindle books, but I do not want a Kindle as it is too locked down, but if I buy a Nexus I cannot access this type of content or their movies. Seems like they are missing an opportunity.